As of 2015 the entire marked Camino extends from Creel 20 kms (by highway) to the railroad crossing somewhat north of the pueblo of Pitorreal. The trail itself is somewhat longer (~25 kms) due to its turns and curves. Some hikers in good physical condition may choose to walk the entire distance in a single day. Others may choose shorter sections along this path as preferred, depending on physical condition, the difficulty of the trail, or other factors. The Camino will be enjoyable in any way. However, understanding the characteristics of each segment suggests certain suggested routes that may appeal to more hikers than others. In general, these suggestions can be experienced in either direction, e.g., from Creel (and returning by bus) or to Creel (after taking a bus to the trailhead). In some cases several of the suggested hikes can be connected together for a longer experience. This hike of ~7.5 kms (one way) enables the hiker to quickly get into the pine forest surrounding Creel with nice views over the town itself. It also passes through nice sections in the trees over easy rolling terrain. It is very close to the railroad and highway for ~ 1 / 2 of the path. Santa Elena is an official bus stop for the Rápidos Cauhtémoc bus company. This hike of ~11 kms (one way) starts in the nice pueblo of San Elias where it may be possible to get an impression of local Tarahumara life. San Elias is an official bus stop for the Rápidos Cauhtémoc bus company. It also features several locations with nice views over barranca country to the west and south. It is very easy to follow for most of its length since it follows the wide old road and a pipeline. Roughly 2.5 kms from the south end, the trail offers a 250 meter side trip to the 360 degree ”loop” of the train as it crosses over itself on its path up the Sierra. On the other hand, from its high point, the trail descends into an arroyo. This arroyo trail is pleasant with views of typical Barrancas country rock formations. However, the arroyo portion requires a short but demanding climb over a final hill before ending at the railroad crossing. There is a nice~2.5 km walk traveling north toward Creel in the forest in Segment 5. Soon after leaving San Elias going north toward Creel, hikers come to the location where the Camino crosses the railroad precisely at the point where it passes under Highway 77. There is a impressive bridge at this point. Thereafter, the trail transitions to a wide rural road through more open forest. Then, after passing through a small valley (El Ojito) with farm fields, the trail climbs gently to a pleasant shady single-track path in the trees on soft pine needle footing with views to the east. At the end of the forest hikers can leave the Camino and walk to the nearby highway to catch a vehicle onward. The tourist center at Divisadero is a well-known visitor destination because it is one of the best stops of the El Chepe train for viewing the Copper Canyon. In fact, the train stops for 25 minutes to permit passengers to visit the Canyon rim, take photos, and buy souvenirs or refreshment. In addition, Divisadero is also a major bus stop for buses from Creel. It is an easy 1 hour bus ride from Creel to Divisadero. See the “Logistics” portion of this guide for information on fares and schedules. The midway point of these Camino hikes is Cerro Alto (the breakpoint between Sections 11 and 12). 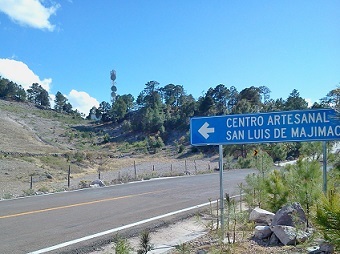 By using public or other transportation, hikers may also be able to use Cerro Alto as the starting or ending point of a day hike. Hikers taking the bus from Divisadero would ask the driver to let them off at the Majimachi intersection / access road. From there it is a steep walk up the concrete road 1 kilometer to the summit. From the top they may either go north toward Creel (Section 11) or south to Divisadero (Section 12). Alternatively, for those making the uphill hike from Divisadero to the summit and not wanting to hike downhill for the return, they could walk down the access road (behind the microwave tower) and catch the bus back to Divisadero. Other hikers may want to engage private transportation from Divisadero to take them directly to the summit, or pick them up there. For Camino hikers wanting the greater exercise of hiking both Sections 11 and 12, there are similar bus and hiking options and combinations for the Highway 77 access point at the start of Section 11. Hikers from Divisadero would ask the bus driver to drop them at the Nacayvo access road 100 meters north (toward Creel) of the Kilometer 37 distance marker. Hikers may have to watch the highway carefully after Kilometer 37 to help the driver identify the access road to Nacayvo Sur (which is very small and not well known). The small wooden houses of the community are visible in a field behind the trees on the east (right) side below the highway. As of 2016, the wide route cleared for the gas pipeline also passes directly through the houses. In addition to good trails on the Camino del Cobre itself, there are other options for day hiking south along the rim (next to and beyond the Adventure Park in Divisadero) and also north of Divisadero along the rim (through an area developed by the Tarahumara community of Mogotavo). Both of these options can easily be added to day hikes on the Camino.